Part of a biosensor device for the new rapid sepsis detection test. Researchers have developed a low-cost rapid detection test for sepsis that can give a result within three minutes. Experts hope the test, which could save thousands of lives, will be available in the NHS within three to five years. At present, it can take up to 72 hours to diagnose sepsis, which kills an estimated 52,000 people in the UK every year. 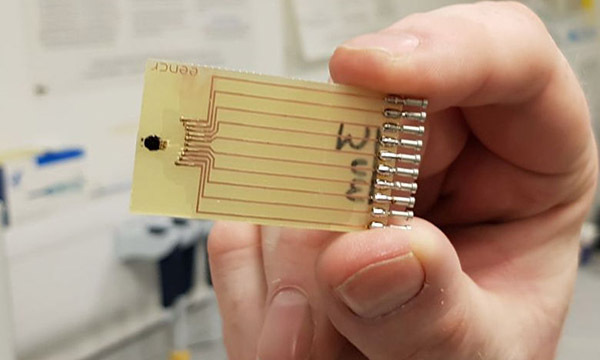 The new test, developed by researchers at Strathclyde University in Glasgow, uses a biosensor device to detect if the protein biomarker interleukin-6 (IL-6) is present in the bloodstream. IL-6 is often found in high levels in people with sepsis. Experts hope the test will one day be used in hospitals and GP surgeries. One of the project’s researchers, Damion Corrigan, said the technology could help nurses and other health professionals identify sepsis faster, saving lives. ‘For every hour that you delay antibiotic treatment, the likelihood of death increases,’ he said. UK Sepsis Trust chief executive Ron Daniels said earlier diagnosis and treatment could save at least 14,000 lives a year across the UK. However, Dr Daniels said increasing awareness of sepsis among health professionals was also key to reducing deaths. ‘No test is perfect in the identification of sepsis, so it's crucial we continue to educate clinicians to think sepsis in order to prompt them to use such tests,’ he said.